As we warm up for the 2015 season of events and conferences, we look back on the APTA Expo held in Indianapolis in February. Over the three-day event, we met a staggering number of Physical Therapists and healthcare professionals who use Dycem every single day in their work. And boy do they have a lot of great things to say about it! In fact, we were so impressed by the attendees’ enthusiasm for our products; we decided to make a record of all of their feedback. Here for you now is a selection of the many different ways PT’s use Dycem in therapeutic settings. 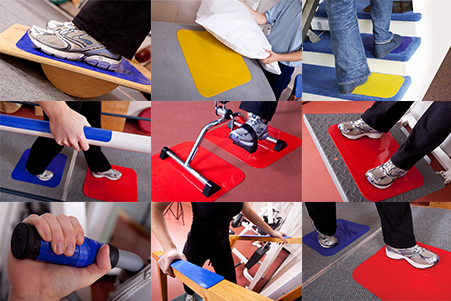 If you are a physical therapist, take a look at our product range or share with us how you use Dycem in your occupation. We’d love to hear from you. CNN analyst, Miles O’Brien, suffered an accident which left him with the use of one-arm highlighted how he uses Dycem in the CNN special report “Miles O’Brien: A Life Lost and Found”. If I try to open that jar (tries to open on kitchen worktop), it’s going nowhere, but on this (Dycem Non-Slip Mat), it works! So that’s really useful for a lot of things. It’s sticky on both sides, it never loses its stick. The powerful documentary features some great milestones with Miles learning to run again, completing a 300 mile charity bike ride & flying a plane. We thank Miles for sharing his story and thoroughly recommend watching the YouTube video below.